These days, the ballooning cost of construction combined with environmental and preservation issues conspire to make extreme infrastructural projects a moot point. Hell, it's taken us almost a century to build the 2nd Avenue Subway. But in the middle of the 20th century, a booming economy and a renaissance in public infrastructure made it seem like anything was possible in New York—literally, anything. Six plans from those years follow, ranging from the grand to the gargantuan. Makes Bloomberg's Vision 2020 plan look a bit puny in comparison, no? The man who owned the Chrysler Building—William Zeckendorf—was behind this idea to build "Manhattan's Dream Airport." 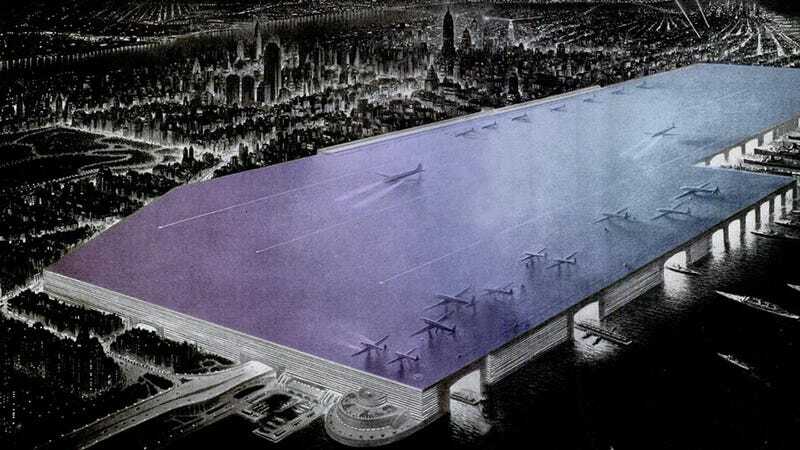 Zeckendorf proposed a 144-block-long floating airport on the edge of the Hudson River, where planes could take off on the long roof and boats could dock at its edges. It's hard to know how New Yorkers of the day reacted to the plan, which was sited on the edge of what was then a still-developing neighborhood. But as Untapped Cities points out, a similar (but satirical) plan to turn Central Park into an airport received over 85,000 earnest signatures—which should tell you something about how "green space" stacks up against "long cab rides" for most modern-day New Yorkers. According to the editors at Popular Science, in 1924, New York was losing $1.5 million a day on traffic congestion. The solution? Get rid of the East River, of course. Dr. John A. Harriss, a "special deputy police commissioner in charge of traffic," was the progenitor of this particular scheme, which would've required the construction of two dams—one at the Williamsburg Bridge, the other, near Hell Gate in Harlem. According to Gothamist, Harriss envisioned the new land supporting a broad avenue of cars and small pedestrian routes, centered by a massive new City Hall. Basically, Brasilia in New York City. The mercifully unfulfilled Lower Manhattan Expressway was one of Robert Moses' plans to modernize Manhattan. LOMEX, as the plan is known, came close to leveling a huge 14-block swatch of Lower Manhattan to build a ten-lane highway stretching from the Holland Tunnel to the Manhattan and Williamsburg Bridges. Moses envisioned the highway edged on both side by gigantic public housing complexes. We actually have LOMEX (along with the destruction of Penn Station) to thank for the development of historic preservation in New York City. Jane Jacobs led the fight against the project, and ultimately, it was abandoned. It's hard to imagine that anyone ever seriously entertained the idea—but we need only look across the East River to see what could have been, since Moses was central in creating the Brooklyn-Queens Expressway, the highway that required the razing of thousands of homes in each borough. A Geodesic Dome Over Midtown Manhattan, 1960. Buckminster Fuller's geodesic dome was proposed with the best intentions: It would've created a bubble of clear air stretching from the Hudson to the East River, between 21st and roughly 64th streets. Of course, in reality, it likely would've led to strict urban segregation in Manhattan, between those "inside the bubble," and those without. Ever wonder why there are no bridges between Lower Manhattan and New Jersey? One of the main reasons is that too many massive freighter ships passed through the bay on their way to Manhattan's docks. But architect Alfred C. Bossom envisioned a seemingly simple solution: A bridge 200 feet above the waterline, more than enough space for ships of the day to pass unfettered. Bossom christened his idea the Victory Bridge, angled as a celebration of the end of World War I. The concept never took off, perhaps because of the sheer size and cost (the towers themselves would've been more than 800 feet high), but Bossom was right on, in some ways: The Holland Tunnel was completed underneath the exact same route, in 1927. *All estimated costs have been adjusted for inflation.